Twice recently, we went out for a private dinner with a group of friends. And both times it was excellent! The food was good and there was plenty of it for everybody to pick and try out different things. The same goes for the drinks. And the whole atmosphere was just great with the entire location all to ourselves and the chefs and other personnel mingling with the group as the evening went on. Best of all, both private dining experiences came at a very reasonable price of between € 45,= and € 60,= per person plus tip, including food, wine and all other drinks! Less than you would pay at many of the better restaurants in Amsterdam. The first private dining option in De Pijp is Carlo di Luca on Gerard Doustraat 224. Carlo has lived in the Netherlands for many years, but you can feel an Italian heart beating inside him as soon as you enter his little shop. There is Italian food everywhere, an iPod playing Italian classics and a large dose of Italian hospitality. We had dinner downstairs in the kitchen, which was cozy and fun with lots of pots and pans and cans of food on the shelves and Carlo behind the stove. The downstairs area seats 6 to 8 people on one large table with high bistro chairs. Carlo also has a larger room upstairs for private dining of groups of up to 20 people. We had prearranged the menu with Carlo, opting for a mix of our own favorites and Carlo’s suggestions of specialties from Abbruzzo, his home region. 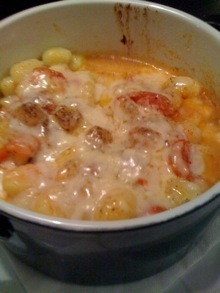 After the antipasti, we had oven cooked gnocchi with a spicy tomato sauce and lots of Parmesan cheese. After that we were starting to feel slightly full, although the main course hadn’t even arrived yet. There were different options, an eggplant Parmesan for the vegetarians, a salted baked dorado for fish eaters and leg of lamb Abruzzo style for the others. All were very good and washed down with plenty of white and red table wine. It was getting late, but there was more merriment to be had. A great double dessert of tiramisu and espresso with ice cream, followed by several shots of limoncello and grappa. We left our private dining room very happy at almost 2am the next morning. Carlo also has a little coffee house where you can try his own home-made espresso and does catering. Another option for private dining is Het Magazijn on Frans Hals Straat, not far from De Witte Uyl, one of dutchgrub’s best Amsterdam restaurants and Da Portare Via, one of dutchgrub’s preferred pizza places. 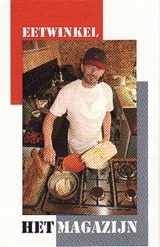 Much like Carlo’s, Het Magazijn is all about one man’s passion for good food in a relaxed ambiance. Owner Tony is Dutch and has traveled around the world, doing many different jobs, finally settling on his real passion, food, and returning to Amsterdam to set up a small take away shop with a large table. The main business of Het Magazijn is take away and many of the locals living in de Pijp on or near Frans Hals Straat drop by after work to pick up a freshly prepared dish. The menu is Mediterranean, a mix of Spanish tapas, Italian pasta and other dishes. Tony also has a large table where you can sit with other guests enjoying the dishes, a few good glasses of house wine and have some fun discussions or catch up on the latest scoop of De Pijp. We decided to rent out the entire shop for a week night and had a great time sitting around the large table. The menu of the evening was tapas and pasta. For starters there were several nice cold cuts like serrano ham and chorizo, an incredibly flavorful truffle mayonnaise, Spanish tortilla and olives. The main course was a choice of pasta, either vegetarian or chicken alfredo. We washed it all down with nice wine and a limoncello at the end and had a great evening for € 45 each. And also restaurant Momo, the hot spot for the cool kids now has a private dining room. 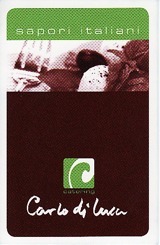 His site is indeed more geared towards his coffee business. 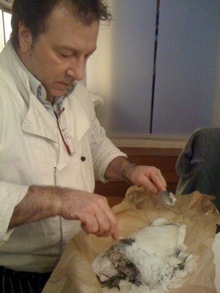 He actually makes his own, which you can also taste during a private dinner.